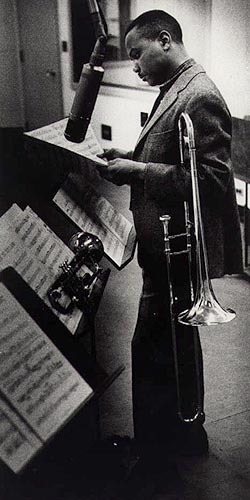 James Louis "J.J." Johnson is considered by many to be the finest jazz trombonist ever. He transformed the trombone in a similar way to the way in which Charlie Parker transformed the saxophone. He transferred Parker and Dizzy Gillespie's innovations to this more awkward instrument, playing with such speed and ease that some listeners assumed assumed he was playing a valve trombone, rather than a slide trombone. He was born in Indianapolis on January 22, 1924. At the age of 9, he studied piano with a church organist, he picked up baritone saxophone during high school, and at the age of 14, moved to the trombone. By the age of 18, he left home to play with Snookum Russel's band, which included Fats Navarro. Benny Carter heard him play once and asked him to join his orchestra on the spot, which Johnson did for nearly 3 years. He moved on to play with Count Basie and Illinois Jacquet, and then what he considered the pinnacle, Parker's sextet. In 1944, he played at the very first Jazz at the Philharmonic concert, where he received notoriety for his ability. 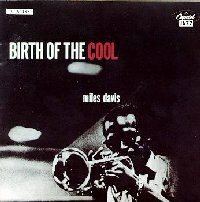 He also recorded with Miles Davis nonet for the legendary recording Birth of the Cool. In 1951, he joined an all-star USO band, which toured Korea, Japan, and southern Pacific islands. When he returned, he found the music business was doing poorly, so he worked as a blueprint inspector for 2 years. He then came back and formed a very popular group with fellow trombonist Kai Winding, called the Jay and Kai group. The New York Classical Jazz and Classical Music Society commissioned J.J. to compose a piece for a brass ensemble. The piece Poem for Brass, resulted from this. According to George Schuller, this music was "third stream", his term for music that combined the jazz and classical music. In 1959, he reorganized his sextet, adding Freddie Hubbard and Arthur Harper to the group. He disbanded the group the next year, in order to work on his compositional skills. He later went on to spend a year traveling with the Miles Davis sextet. In 1964, he joined the Radio Corporation of America's roster of musicians and toured Japan with a sextet including Clark Terry and Sonny Stitt. Four years later, he was commissioned, once again, to compose, this time by Robert A. Boudreau, Music Director of the American Wind Symphony Orchestra, located in Pittsburgh, Pennsylvania. The results were Diversions for Six Trombones, Celeste, Harp, and Percussion. He moved to Los Angeles in 1970 in order to write music for television and movies. He ended up writing for the popular television shows That Girl, The Danny Thomas Show, Mayberry R.F.D., and The Mod Squad. His movie credits include Cleopatra Jones, and Shaft. Oddly enough during this time, he was still winning Downbeat polls for best trombonist, even though he wasn't performing. He returned to performing and recording in 1977. Though he has retired from traveling, he still records to this day.